"Yes, Montana Silversmith belt buckles are actually made in Montana," I said. It was a fair question. 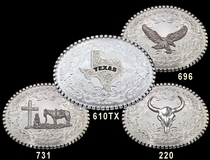 In this day of automated this, and outsourced that, it's almost shocking to find a fine, high-quality American product (like Montana Silversmith belt buckles) that has not lost its innocence, been bastardized, or been conglomerated by some multi-national thingamajiggy. 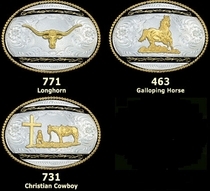 We at GoldMountainTrading.com proudly offer Montana Silversmith belt buckles. We have have had a relationship with Montana Silversmiths - and have been selling Montana Silversmith belt buckles - since 1980. We can vouch for the high quality of Montana Silversmith belt buckles and give them as gifts even amongst our own family. "So, you see, kids, if you want to design Montana Silversmith belt buckles yourselves, you have to keep working on your art skills. Being an artist is one of the greatest things you can do. And working on Montana Silversmith belt buckles by working for Montana Silversmiths would be a great achievement. It is a real American company and you'd be creating a fine product that will be passed along for generations." Yep, I was on my soap box. But how can you not be inspired when you see the quality and detail of Montana Silversmith belt buckles? And doesn't it just warm the cockles of your heart to know that your Montana Silversmith belt buckles were hand crafted by true artisans right here in the U.S. of A.? It sure does to us at GoldMountainTrading.com. Consider our cockles warmed. Be assured that your Montana Silversmith belt buckles didn't come over from Asia in the dreary bow of a ship, spending months in a dark, dank, mildewy cargo hold. "After the artist has finished her masterpiece on paper, the next step in making Montana Silversmith belt buckles is for the folks in the production department to hand carve the buckle master. This will be used to create a die mold, from which the Montana Silversmith belt buckles will be cast." You'd think with that last statement that I might have lost of few of them little varmints along the way. Nope, they were right there with me the whole way, soakin' in everything anyone ever wanted to know about making Montana Silversmith belt buckles. A darned fine bunch of kids. We later had 'em all over at the GoldMountainTrading.com offices for some fun treats and to show 'em the next step in the process of getting Montana Silversmith belt buckles from Montana Silversmiths to our cherished customers' front door. They saw how we placed our order for Montana Silversmith belt buckles with Montana Silversmiths. They saw how Butch, our UPS guy, came by every day with boxes and boxes of Montana Silversmith belt buckles. They helped us inspect every single buckle for quality assurance. Not that there is much need in doing this, we just care about our customers, is all. Finally, they saw how we box up the Montana Silversmith belt buckles all nice and purty, and send e-mail messages to dear customers to let them know their Montana Silversmith belt buckles are on the way. Yes, Montana Silversmith belt buckles are made in Montana but they are shipped to your door from our delightful western gift store in Phoenix, Arizona.